I've got to say, I'm pretty impressed with the promotional items Anberlin's management sent me that are tied to their Dark Is The Way, Light Is A Place album that was released earlier this month. First up is a 7" vinyl single with "Impossible" on one side and a non-album b-side, "Hell Or High Water" on the other. "Hell Or High Water" is a riff-driven rocker with a pounding beat and a wailing vocal. It could've easily fit in with the other songs on Dark Is The Way, Light Is A Place but could've possibly been held off in favor of a more diverse, down tempo number. 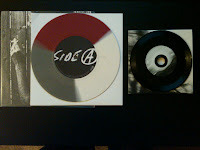 The actual vinyl is also a cool tri-color mix of white, gray and maroon. The second piece is incredibly interesting as well. It's a unique cd/vinyl hybrid and I've never seen anything like it. The cd/digital side looks just like the shiny underside of a cd and the vinyl/analog side has a thin outer ring of vinyl grooves imbedded in the plastic. 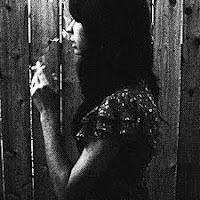 The cd contains another non-album b-side, "I'd Like To Die," and a music video for "Impossible." 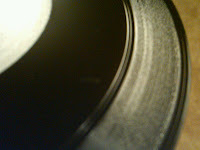 The vinyl side contains "We Owe This To Ourselves," the opening track on Dark Is The Way, Light Is A Place. The actual vinyl is a little tough to play because of its size and its spindle hole being the normal cd size, meaning it's bigger than a regular vinyl spindle but too small for a 45 rpm adapter. It's no big deal though because the coolness factor way outweighs the functionality factor. Anberlin really came up with some cool promo items this time around and I can only hope that it inspires other bands to do the same in the future. Man I didn't know the new Anberlin album was so awesome. I'm going to have to pick it up next time i'm in Best Buy!